The Lord here is called Vaiyagam Katha Perumal or Jagath Rakshaka Perumal meaning the protector of the world. The Lord is believed to have appeared for sage Nandaka.The temple is among the 108 divyadesams of Sri Vaishnavas and comes under Chola naatu divyadesams. 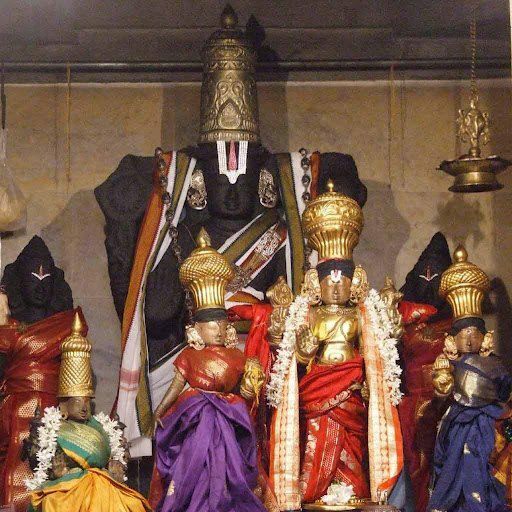 The presiding deity here is Sri Vayyam Kaatha perumal, also called Uyyanthavar or Jegat rakshakan (one who protects the world) in standing posture. The temple is a purana sthalam as well as a prarthana sthalam and is known as Sangama kshetram. There is a five tier rajagopuram in the temple. Thayar here is known as Padmaasani or pushpavalli thayar. The place got its name as koodalur which means coming together as all the devas had approached Lord Vishnu to save the earth from demon Hiranyakshan at this place. Perumal in the temple appears as if always ready to come to the rescue of His devotees with His Chakra-discuss. King Ambarisha drowned in the worship of Lord, failed to strengthen his army. He lost his kingdom too. Not deterred by the loss, he continued his devotion to Lord only. He was observing the Ekadasi fast one day with his habitual meditation. He did not notice that Sage Durvas came to see him. The sage thought that Ambarisha ignored him and cursed the king. Ambarisha fell at the feet of Lord for protection. Lord applied his discus on the sage which began to chase the sage. Finally the sage surrendered to Lord and begged his pardon. Ambarishan built a temple for Perumal in this place. Hence, He is also praised as Ambarisha Varadhar. Those praying to Perumal here are protected by Lord Himself directly guiding them in life. All the holy rivers joined in Cauvery to cleanse themselves of the sins left on them by peope. Thus Cauvery had to bear the total sins of all. 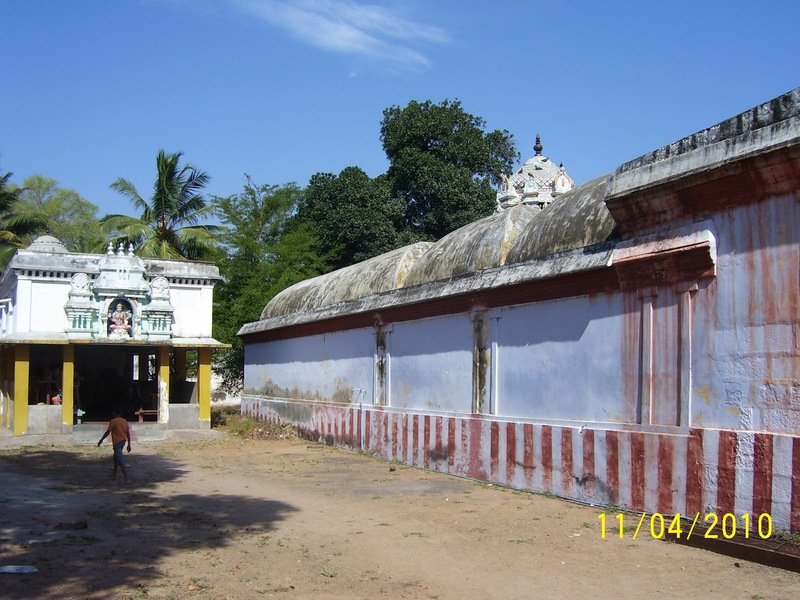 She approached Lord Brahmma for solution who suggested that she pray to Perumal in this place for relief. Thus Cauvery purified herself by the grace of Perumal in this place. A parrot living in this temple complex used to pick a blackberry (Naval fruit) from a tree and place it at the feet of the Lord chanting Hari Hari. One day, when it was bringing the fruit, a hunter shot it down, the bird fell chanting Hari Hari. Hearing the parrot chanting the name of Lord, the hunter was scared and ran away from the place. Lord Vishnu gave darshan to the parrot and reminded of its past birth as a scholar but a pedant and that it was cursed to be born a bird and that it remembered His name chanting it for ever. Lord relieved the parrot of its curse. The message of the story is that salvation is open to those placing themselves at the feet of Lord chanting His glorious name. It is noteworthy that the sacred jack tree behind the sanctum sanctorum has a conch symbol as if naturally gown. When the discus chased Sage Durvas, the conch had all the prominence here and this symbol is related to the story. Worshipping this natural conch and the discus together ensures immense benefit to the devotee, it is strongly believed. Of the Navagrahas-9 planets, this place is linked with Ketu importance. Sri Sheektha (Sri Sukta) Homa is conducted in the temple with 108 lotus leaves on full moon days. During His Varaha Avatar, Perumal went deep into earth. The gap between the two feet of Perumal in the sanctum sanctorum is considered the centre point of the world. Sage Nandaka and Devas came together (Koodi in Tamil) here to worship Lord, the place came to be known as Koodalur. Demon Hiranyaksha fought with Mother Earth and hid her under the world below-Padala Loka. Lord rescued her back to her place with His Varaha Avatara. He split the earth for the purpose and brought back her at Sri Mushnam. Remembering this event, Saint Tirumangai Azhwar praises this place as Pugunthan Oor (Lord entered into earth). As Lord protected the world (Vaiyagam) from the demon, He is praised as Vaiyagam Katha Perumal. Lord Perumal graces the devotees in a standing form. The vimana above the sanctum sanctorum is called Suddha Satwa Vimana. The devotees strongly believe that the very discus of Perumal would be a security to them if they surrender at His Lotus feet. Devotees offer sugar candy and butter to Perumal as neivedya for prosperity and marital harmony. The temple is around 25 kms from Kumbakonam and can be reached by travelling in buses plying to Thiruvaiyaru. The bus stop is in front of the temple. The temple is about 5 kns from Thirukavithalam and Thirukandiyur, Thirupullamboothangudi, Thiruaadhanoor and Thanjai Maa Mani divyadesams can also be covered at the same time if a private car/auto is booked for half a day. The temple is open from 7.30 a.m. to 12.30 p.m. and from 4.00 p.m. to 7.30 p.m.
Sri Vaiyagam Katha Perumal Koil, Tirukudalur-614 202, Thanjavur district.